The remodelled Margaritaville Beach Resort Grand Cayman features a wonderful swimming pool and a new restaurant from celebrity Chef Roy Yamaguchi. Jimmy Buffett fans have another place to look for their lost shaker of salt. 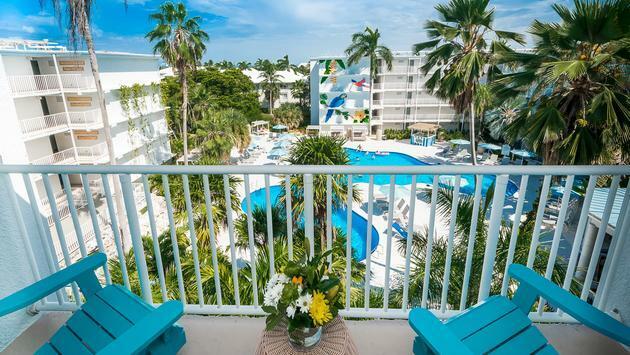 After a multiyear, extensive renovation, the new Margaritaville Beach Resort Grand Cayman will officially relaunch on Nov. 1, 2018. The massive overhaul includes all of the property’s 285 guestrooms, the addition of over 8,500 feet of meeting and event space, a new fitness center and a completely reinvented culinary program. A trio of new restaurants, including celebrated chef Roy Yamaguchi’s first Caribbean outpost, Eating House 1503, will be unveiled as part of the resort’s enhancements. The guestrooms, all with a balcony or patio, feature signature brand touches to let guests know they have arrived at Margaritaville. The casual-luxe design incorporates subtle white-on-white embedded parrots on the duvet covers and fins replace the typical faucet handles in the bathrooms. Compasses, a purposefully addition to the room design, adorn table tops and cabinetry to infuse elements of the sea and sky into the hotel. The artwork mirrors an “island escapism” lifestyle and are a collection of photographs that reflect beach living. Tropical touches, from a palm tree on the wooden headboard to intertwined driftwood branches to create bedside lamps, deliver fun and a true sense of arrival at what is intended to be a laidback escape rooted in relaxation. The accommodations, with colour palettes derived from the hues of the sea, feature a wet bar and in-room refrigerator, microwave (upon request), 55” LCD flat-screen HDTVs, laptop-sized safes, Keurig® coffee makers, iron/ironing boards, workspace complete with a desk and complimentary high-speed Wi-Fi. The 8,500-plus square feet of meeting space is a new addition to the resort and a design juxtaposition of formal meets fun. White wainscoting throughout complements the statement carpet, which is Caribbean blue with blurred and overlapping lime and burnt orange sand dollars. The highlight is the nearly 4,700 square-foot ballroom, which is already a sought-after venue for weddings and special events. Complementing this is the pre-function area (2,112 square feet), four breakout rooms and an executive boardroom (377 square feet), all boasting 14-foot ceilings. One of the most noteworthy and significant changes to the resort is the addition of three new restaurants, including a signature eatery, Eating House 1503 by award-winning chef, author and TV personality Roy Yamaguchi. A spin-off of his Eating House 1849 in Hawaii, Yamaguchi’s first Caribbean restaurant will highlight an eclectic menu ranging from steak to sushi, ramen and wild boar-blended cheeseburgers. It is a fusion between Hawaii and the Caribbean’s finest seafood, with a fun twist that is reflective of an island escape. The name pays homage to the year the Cayman Islands were first spotted by Christopher Columbus in 1503. The layout of the restaurant was extremely purposeful with every seat intended to give the “best-seat-in-the-house” feel.